A wise man once said that there are two things that are inevitable in life: advertising and urination. Well, maybe that’s not exactly how the saying goes. In the world of the men’s room, though, the two often intersect in the form of well-placed posters for upcoming concerts and sporting events, ensuring that the only time you’re not looking at a screen will be spent learning what you should be buying. 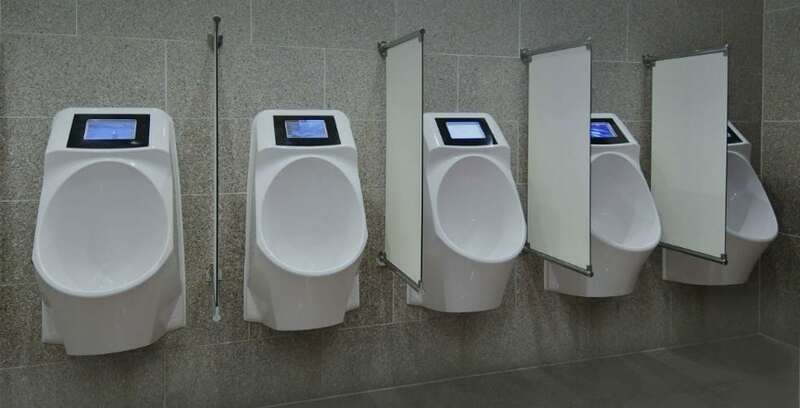 Well, this collaboration will likely continue with the introduction of a smart urinal that flashes ads at you. The future truly is now. Created by the Dutch startup company of the same name, Mr. Friendly (which totally sounds like a corporation that is secretly making evil robots) is a smart urinal brand that is programmed to show ads while you’re using the restroom. The technology is so refined that it will only show you the advertisements while you’re using the restroom. Which is great news, I wouldn’t want commercialism to ruin any other part of my restroom routine such as washing my hands.